Vendors in Chiredzi protesting against Council authorities. 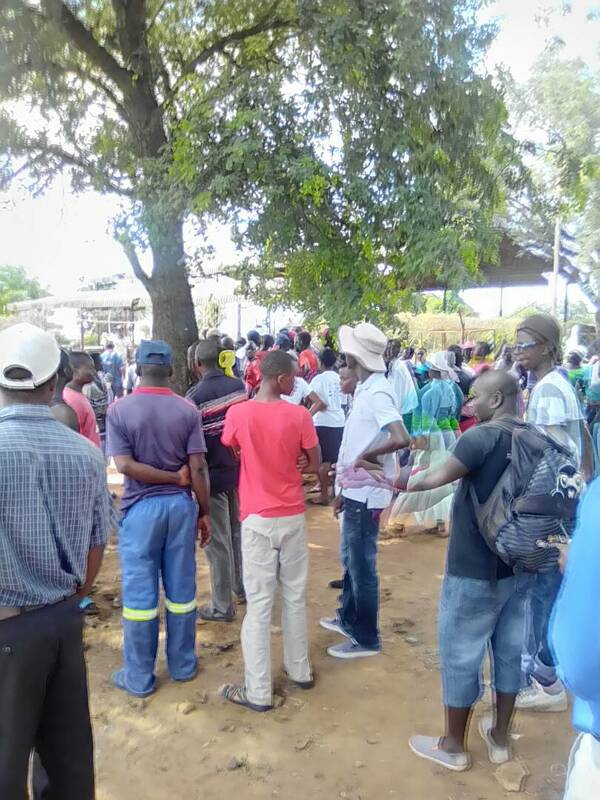 The Zanu Pf led Chiredzi town council has been castigated by vendors union, Vendors Initiate for Social and Economic Transformation (VISET) and some residents after Council Chairperson, Francis Moyo had an altercation with vendors in the town. This comes after vendors who barricaded Mr Moyo’s car after they had stopped the chairperson from leaving protesting about a US$15 levy that they were allegedly forced to pay. It is further alleged that the conflicts started when vendors were moved from the streets to N. Richards Wholesalers and they were later told by another Councilor hopeful to return to the streets to pave way for developments to be made at the new site. “The vendors were moved from streets and dumped opposite N. Richards Wholesale and paid $15 for a place to work from.” said Mr Marko Shoko, a Chiredzi resident. According to Shoko today the council came to remove the vendors from the streets again on orders believed to be from the Town Chairperson, Francis Moyo and by so doing the vendors became frustrated leading to the stoning of Moyo’s car. Mr Samuel Wadzai Chairperson of the VISET lambasted the move by Chiredzi town council saying it was regrettable that the government was worsening their economic situation. “Vendors have been victims of abuse for a long time.” he said. Mr Wadzai further castigated politicians who use vendors to push their political agendas. “We don’t expect politicians to make our lives worse. We refuse to be used in dirty politics.” added Wadzai. “Our struggles are economic in nature, we want to survive in this harsh economic environment, so these ZANU PF aspiring candidates must not take us for granted.” said Wadzai. Last month, the Chiredzi council was at crossroads with tuckshop owners who were refusing neither to close their businesses nor to demolish their businesses claiming that the council had been collecting levies from them for the past 20 years. “The vendors have expressed their discontent with the ZANU PF led council to use them as a campaigning tool so as to lure 2018 votes. This scenario only shows two factions of ZANU PF at play. People are now ready to resist being taken for a ride by politicians.” said another resident who refused to be named for fear of victimisation. The relocation of vendors in Chiredzi started in February this year following the circular from Local Government Minister July Moyo to remove illegal vendors from the streets. Efforts to get a comment from the Chiredzi Town Council were fruitless by the time this story went for publication.